PIROMAX nozzle heaters are a top-quality product that is the result or ROTFIL unique high-technology. They are sealed against external agents such as melted plastics. PIROMAX are a rugged product that is very resistant to wearing and shocks. Their high watt-density per square centimeter allows a fast and safe reaching of the required working temperature. During manufacturing, the heaters are submitted to extremely high pressure that ensures high insulation, excellent thermal exchange, lack of internal voids, perfectly smooth contact area for an optimum and uniform heat transfer to every part of the nozzle. 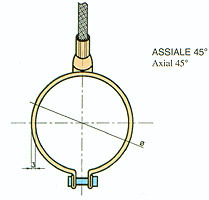 The inner profile is perfectly round, providing a perfect coupling with the nozzle. 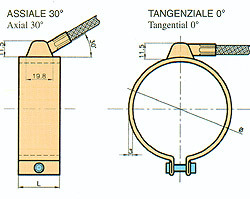 Size of the connecting cap is minimal, giving extremely limited overall dimensions. 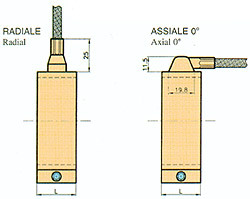 Power connection is performed by a metal braiding cable, standard length 1 m, with two nickel power leads and one galvanized-copper ground lead. - Brass tubular sheath (available in stainless steel for corrosive materials such as PVC). - Power standard density: brass 4.5 W/cm², stainless steel 5 W/cm². - Tear-resistant connection of power cable. - Dielectric strength: 1500 V.
- There should be no air gas gaps between nozzle and heaters (too loose heaters should not be used). - After the initial heating up period the clamping screws should be retightened . - Alternative flexions of the connecting leads near their exit from the heaters should be avoided. - Plastic material on the heater surface should be removed by raising the melting temperature of the material. Avoid hammering and drying to tear the plastic material free.